« Mini Rich Task this week: Marketing Blackpool. 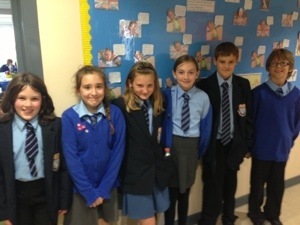 Some students from Collegiate High School went to visit Year 6 at Layton Primary School. They spoke about our Open Evening on Monday 8th October at 6.30pm. They talked about how they felt when they started high school and how they have settled in. Year 6 then took part in a team building activity using QR codes. They had to scan the codes, which revealed the questions, such as “Who has a birthday in November?”, and then find one of their peers who has a birthday in that month. Year 6 were fantastic at this activity and completed the task successfully! This entry was posted on October 4, 2012 at 9:49 am and is filed under Year 7. You can follow any responses to this entry through the RSS 2.0 feed. You can leave a response, or trackback from your own site. We had a fantastic time when you visited Year 6 at Layton Primary School, on Tuesday afternoon. The children were very impressed with the QR codes activity and that you all have your own iTouch!!! They’ve been brought back to reality today and have been eating gruel (as we have been learning about Workhouses).